OneClickdigital and Zinio Magazines Are Now RB Digital: New Look, New App, Same Great Content – Now in One Place! The new RBdigital app and refreshed website officially launched on June 26! 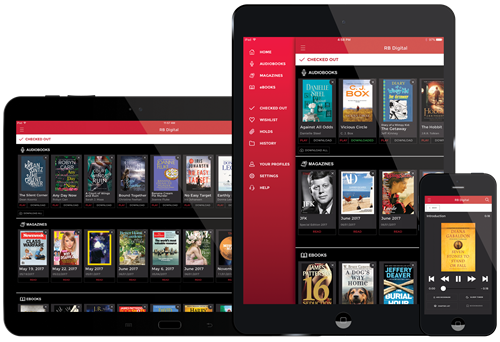 The new RBdigital app combines the OneClickdigital audiobook/eBook app with the Zinio for Libraries magazine app. For the first time in the industry, patrons whose library offers both services (like BCLS) are now able to access audiobooks, magazines, and eBooks—all in one app! Existing OneClickdigital and Zinio for Libraries app users have been notified through their OneClickdigital app to upgrade to the new RBdigital app. When you update the app, you can log in with the same credentials you used for the OneClickdigital or Zinio for Libraries app. The new RBdigital app will have all your previous checkouts along with stored wish lists, holds, and history, but those checkouts will need to be downloaded again. 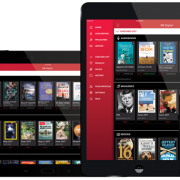 Offering the library market’s most comprehensive platform, RBdigital brings exclusive audiobook titles, eBooks, and content from all major publishers together in one collection. RBdigital features the best literature in a wide variety of genres, along with an outstanding collection of award-winning children’s and young adult (YA) books—over 60,000 audiobooks and 250,000 eBooks! RBdigital also delivers 100% of the New York Times bestseller list available to libraries as downloadable audiobooks and more multi-access titles than anyone else! RBdigital also offers complete digital editions of popular magazines with interactive elements such as audio and video. With RBdigital you can keep magazines for as long as you like and even download magazines to your mobile device for offline reading. Click here to search BCLS’s RBDigital catalog. Get the app in the Apple Store. Get the app for your Kindle Fire.